Awesome sp FTW, just 1m+ more exp and u get 99 str! GRATS SP ON 98 STRENGTH! 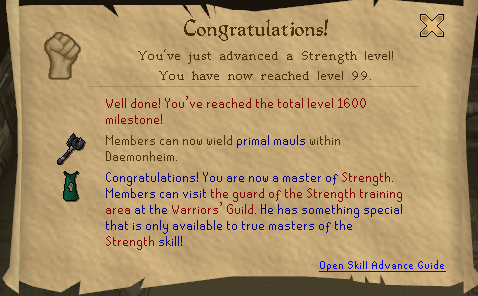 WOO 99 strength ftw! y can i never train like u pro's? k postpone till 15 october or sumthin?? Wow sp your fast!!! Gratz on 98 str and gl on 99 str. But, i still tink def > str. NICE SP... Congratx on 99 STR ! !